NEW YORK, June 18, 2015 – Water, it’s the source of life for every person, plant and animal on earth. But although 70 percent of our planet is covered with water, 97.5 percent of it is salt and 1.5 percent is frozen in glaciers, leaving only about one percent for human consumption. That one percent is rapidly shrinking as populations expand and industrialization, pollutants, crumbling infrastructures and climate change threaten a dwindling and increasingly compromised water supply. The need for water conservation and focus on sustainable and eco-conscious industry practices has never been stronger. GROHE, the world’s leading single-brand manufacturer and supplier of kitchen and bath fittings, has developed a CEU, The Edge of Water – Trends & Best Practices in Building Water Use, for members of AIA, ASID, IIDA and USGBC that also qualifies for Health, Safety, Welfare (HSW)-related training. Being presented at the GROHE Live! Center in Manhattan and at other showrooms and venues across the U.S., The Edge of Water makes a strong case for conservation, while outlining the seriousness and complexity of the problem and importance of water conservation efforts in buildings. With this educational initiative, the German company, known for its innovative and advanced technology and industry-leading sustainability, offers architects and designers viable green practices and solutions for their projects. A summary of the key points presented follows as well the GROHE technological advancements that can help meet the demands for water conservation. Rising costs, global warming and severe drought conditions pose a serious global threat to which few nations are immune. In the U.S., the critical drought in California is impacting water supplies and agriculture and food prices, nationwide. In just one year, greatly reduced mountain snowfalls sharply cut the state’s water levels, demonstrating the unreliability of key water sources. GROHE notes that the costs of treating, distributing, heating and pumping water are already the highest of any utility and those costs are quickly rising with no end in sight. In the next 25 years, the United States must pay an estimated $1 trillion to replace water pipes and processing facilities. These reductions greatly impact carbon footprints. GROHE advises that by retrofitting one out of 100 American homes with water-efficient fixtures, the U.S. could prevent approximately 80,000 tons of greenhouse gas emissions, the equivalent of removing 15,000 cars from the road for one year. As challenges to the water supply increase, so do efforts by both the public and private sector to conserve it, via legislation and conservation programs. For example, expectations to participate in Green Building practices, like LEED, are high and requirements for LEED status have become increasingly stringent across the board. LEED v4 requires that all newly installed fixtures carry the WaterSense label that identifies a water-efficient product that has been independently tested and certified to meet EPA WaterSense criteria for efficiency and performance. All products displaying the WaterSense label are recognized by the EPA’s partnership program, WaterSense, and offer significant savings while meeting strict performance standards, including the CALGreen building codes standard. The popular GROHE Eurosmart faucet has been redesigned to increase the distance between the spout and the lever while raising the overall height. It raises the bar on sustainability as well by limiting water consumption to 5.7 liters per minute, among other enhancements. Restroom faucets and kitchen faucets are the easiest to specify at a lower flow rate (typically 0.5 gpm for restrooms and 1.5 or 1.0 gpm for kitchens).Typically, going down to these flow rates do not effect user enjoyment – in fact, rarely do people notice the change. Single-lever mixers are a good choice over double-lever mixers, because they make it easier to hit the desired water temperature without wasting time while water is flowing. Digital faucets also allow for setting the temperature, flow rate and duration to further save water. They also can be set to have an intermittent stop period for a “brush your teeth mode” to save water and the hassle of turning the faucet on/off. Toilets can also easily be specified at a lower flow rate. Dual-flush toilets have become popular and can symbolize a company’s commitment to sustainability/water savings. There are many situations (e.g. a hotel) in which decreasing the water flow for shower heads is undesirable. However with new technologies, a 1.75 gpm to 1.5 gpm shower head or even lower can be installed without affecting the user experience/enjoyment. 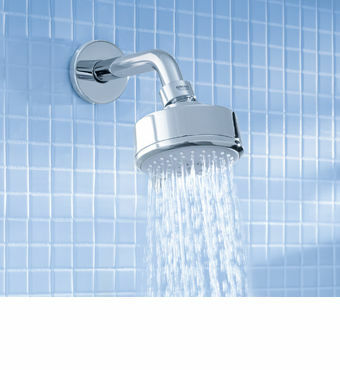 The shape/design of the shower head (such as an oval shape) can use less water while keeping the “full spray” feel. Other features, such as adjustable flow “eco” buttons that let the use decide when to go super low flow and when to use the high flow can help reduce water use without sacrificing user experience. Shower thermostatic valves and digital shower settings can help to avoid that two to five minutes or so every morning that a shower is left on to let the water heat up. GROHE’s New Tempesta Cosmopolitan 100 shower head, offers two different spray settings while still maintaining a max flow rate of 1.75 gpm to comply with EPA WaterSense criteria for efficiency and performance. Many of GROHE’s highly advanced showers and faucets carry the WaterSense label and are CALGreen compliant and all offer a range of solutions for controlling water flow and temperature, conserving water while still providing an exceptional user experience. GROHE Low Flow Solution Kits provide a low-flow aerator plus reducing fittings at the supply end, effectively controlling flow and water pressure. The revolutionary GROHE TurboStat® technology delivers water at the user’s desired temperature within a fraction of a second, wasting neither time nor water in getting the temperature and pressure right and keeping them consistent. GROHE products are easy to install and maintain, making them both cost-effective and efficient, thanks to superior engineering. 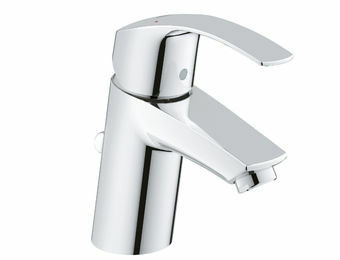 GROHE SilkMove® technology offers unique faucet cartridges manufactured from an advanced ceramic alloy and coated with a special Teflon lubricant, allowing for near friction-free, smooth operation for a lifetime of use – far superior to plastic cartridges used in many products. For more information about GROHE’s CEU programs, contact Irvin Johnson.